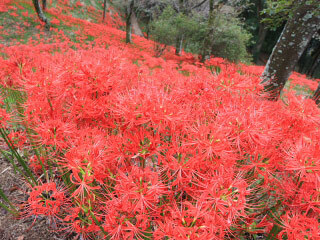 Spider Lily at Shiroyama Park (城山公園の彼岸花) is a beautiful spot of Motegi, Tochigi Prefecture. Around the middle of September, about 300,000 Higanbana, spider lily, will be blooming in this park. The slope side of the mountain will be covered deep red by the flowers. It is the main feature of September here. 1. use local bus to Motegi station. Shiroyama Park is the ruins of castle in old time. Today, about 300,000 Spider Lily are planted and bloom beautifully in the middle September. During the season, there is Higanbana Matsuri.